The phone rang and I pushed my chair back as I realized it was my Amma. Sensing it was a good time to take a break. I walked over to the kitchen and glanced at the clock. Tucking the phone between my neck and ear, I started on the dishes. Minutes passed and the sink emptied as I caught up on the day. Even as I scrubbed till the metal of the sink looked clear, Amma hung up and I stretched my neck muscles. I started to get back at work when the row of cups behind the glass where I had put them caught my attention. I walked back to the stove and set water to boil for my afternoon cup of tea. I scraped ginger over the hot water and rinsed the cup in anticipation. Watching the water boil, I remembered another such morning as my friend made tea for the two of us in her kitchen. The fragrance of spices, the foaming creamy milk and most of all the earthen cup in which she served it. I traced the pattern around the rim and said it was beautiful. “You take it”. She said simply. No preamble. No hesitation. I smiled and mock protested and promptly forgot all about it till it was time to leave and a neatly packed amazon box sat on my suitcase. She had remembered. Remembered to pack the full set of cups because I liked it. Sitting at my island sipping the warm tea, I knew this was a gift that would keep on giving. The gift of knowing I had friends who valued me. The gift of being enveloped in love. The gift of knowing I am cherished. Some days when I feel low, all I need is a cup of tea to remind me of the good that surrounds me. Previous Push or let go? cherish the cups and the moments..
by the look of the beautiful cup, I kind of knew who the friend is. 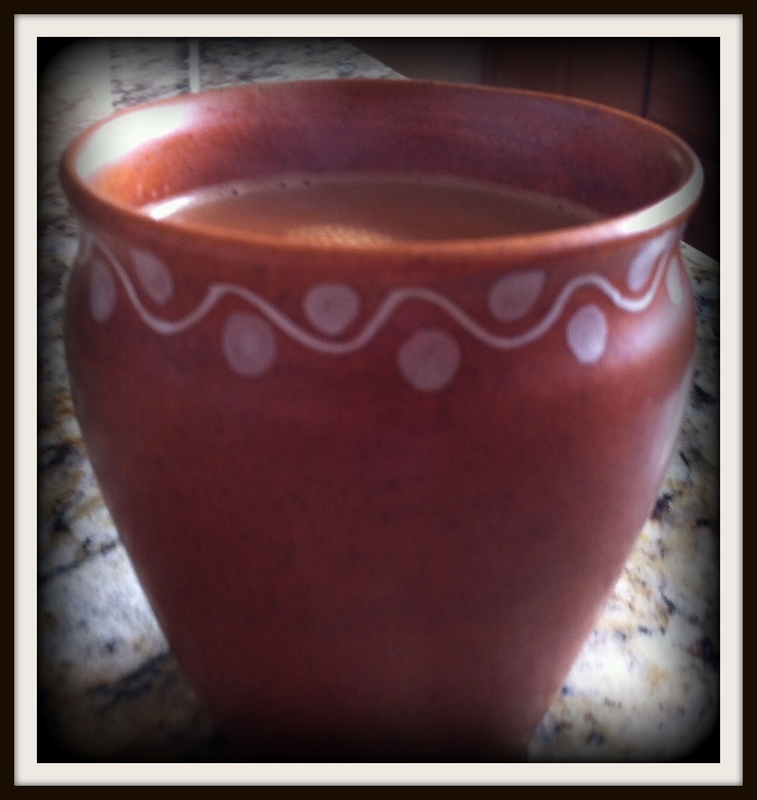 Value of a cup is what you make of it/memories associated with it/the person who gave it to you. You post,as always , is very visual Laksh!. Could see the bubbling creamy milk, smelled the ginger. I feel so content and full, as if I shared that tea with you. God bless you and the hands that gave you this precious cup!